The increasing incidence of skin cancers and photo damaging effects caused by ultraviolet radiation has increased the use of sun screening agents, which have shown beneficial effects in reducing the symptoms and reoccurrence of these problems. Sunscreens are regulated throughout the world either as cosmetics, over-the-counter (OTC) drugs which do not require a governmental pre-approval or OTC drugs that require a pre-approval before they are placed on the market. Regardless of how they are regulated, all of these product regulations are very similar concerning sunscreens! Each country has a pre-approved list of permitted UV filters, an accepted method of running efficacy by SPF determination, and regulated labels. Some countries have approved methods for UVA claims and water-resistance testing. This review will focus on several topics highlighting sunscreens starting from definitions, regulatory aspects and sunscreen classification. Sunlight that reaches the earth surface consists of two main parts, the shorter wave lengths are known as UVB which is responsible for sunburns. Sunburns are always more severe in fair skin but may occur with any color of skin. Sunlight striking the Earth is composed of 50% infrared, 40% visible, and 10% UV. Of the UV component, 9.5% is UVA and 0.5% is UVB. UVA penetrates deeper into the skin than UVB, and causes immediate suntan, not sunburn. UVA also generates free radicals in living skin, which contribute to skin damage, wrinkling, and skin cancer. UVA rays can also penetrate clothing and glass, causing cumulative skin damage over time. Studies over the past two decades show that UVA damages keratinocytes, skin cells located in the basal layer of the epidermis. It is well established that ultraviolet (UV) radiation induces immunomodulatory effects that may be involved in skin cancer. Recent studies have shown that UVA (320-400 nm) and UVB (290-320 nm) radiation are immunosuppressive. As a result, sunscreens, which mainly absorb UVB, may be less effective in preventing UV radiation-induced immunosuppression than broad-spectrum products (8). Broad-spectrum sunscreens provide better protection from solar ultraviolet-simulated radiation and natural sunlight-induced immunosuppression in human being (9). 1. Provide efficient protection against acute and long-term UV-induced skin damage. 2. Be stable to heat and to UV radiation (UVR). 3. Be user-friendly to encourage frequent application and provide reliable protection. The new sunscreen products exhibit a high photostability and a high level of protection against the entire range of harmful UVR. In addition to providing extremely reliable protection against sunburn, they have been shown to prevent both acute and chronic UV-induced damage and are particularly useful in preventing photo-induced dermatologic disorders (9). Sun Protection Factor (SPF) is the number on a scale ranging from 2 to 100 for rating the degree of protection to screen or block out the sun’s burning rays. However, it only measures UVB rays, not UVA rays. SPF numbers measure how long a sunscreen will protect you from burning compared to how quickly your skin turns red without sunscreen. For instance, if your skin starts burning 30 minutes after being out in the sun with no protection, a sunscreen with SPF 20 would prevent you from burning for 600 minutes (30 min x 20) or 10 hours. This, of course, is dependent on the sunscreen's stability and whether you correctly wear and re-apply it in the first place. PPD (persistent pigment darkening). measures a sunscreen's amount of protection from UVA rays. UVA rays are the ones responsible for aging and UVB rays are the ones responsible for burning. PPD values aren’t measured as precisely as SPF numbers. In fact, there is no standardized system for determining them, so there is some ambiguity in their assessment. PPD is also known as PA in some countries with plus signs (ex. PA++) that signal UVA protection strength. The higher the PPD number or the greater the number of plus signs, the better a sunscreen protects against UVA rays. Broad spectrum provides protection against UVA+UVB by providing a chemical barrier that absorbs or reflects UV radiation before it can damage the skin. Limiting time in the sun, wearing clothing to cover skin exposed to the sun (long-sleeved shirts, pants, sunglasses, and broad-brimmed hats) when possible, using a water resistant sunscreen if swimming or sweating, reapplying sunscreen, even if it is labeled as water resistant, at least every 2 hours (16). Apply 30 minutes before you go outside and use enough to cover your entire face and body (avoiding the eyes and mouth). An average-sized adult or child needs at least one ounce of sunscreen to evenly cover the body from head to toe. It's true that dark skin is higher in the pigment melanin than light skin, which can provide some protection against skin cancer and aging. Dark skin people should wear a broad-spectrum, UVA/UVB sunscreen with an SPF of at least 15 whenever they go outside (6). Insect repellents reduce SPF, so if used, a stronger SPF is needed and replenished more frequently. Many toiletries contain sun protection ingredients, but often do not provide adequate protection. The sunscreen should be applied generously. On the other hand, moisturizing cream and makeup spread only to the extent desired. As a result, the amount of sunscreen material in cosmetic products does not provide the desired protection. Therefore, first apply the moisturizer and wait for its absorption in the skin, and then apply the sunscreen generously. Make-up Apply after applying the sunscreen (after being absorbed into the skin). The critical wavelength is the wavelength at which the sunscreen allows 10% of the rays to penetrate. A sunscreen with a critical wavelength over 370 nm is considered by the FDA to provide excellent UVA protection. In Europe and in Israel Sunscreen products are designated to protect against UV radiation. They are classified as cosmetics according to EU Regulation (EC) No 1223/2009 (1), according to Israeli MOH (Ministry of Health) as dedicated cosmetic products. According the Israeli MOH, sunscreen can be titled as broad spectrum - UVA BALANCE, if it protects against UVB and UVA radiation with at least 30 SPF and contains UVA90% UV protection (2, 3). In Europe , New Zealand, some of the Middle East, Turkey and ASEAN countries. In these areas the EU regulation is accepted and applied as it is or with minor changes. The main point in this case is to check whether the local legislative status of some of the sunscreens are regulated as cosmetics, not as drugs, and are subjected to different marketing requirements. Any sunscreen sold in the United States is regulated as a drug because it makes a drug claim - to help prevent sunburn or to decrease the risks of skin cancer and early skin aging caused by the sun (16). The vast majority of sunscreens available in the United States are marketed under a regulatory framework called the OTC Monograph System. FDA reviews the active ingredients in these products to determine whether the ingredients are generally recognized as safe and effective (GRAS) for OTC sunscreen use (5). In US sunscreens are currently sold over-the-counter (OTC), but they need to effectively protect from UVA and UVB. Prior rules on sunscreens dealt almost exclusively with protection against sunburn, which is primarily caused by ultraviolet B (UVB) radiation from the sun, and did not address ultraviolet A (UVA) radiation, which contributes to skin cancer and early skin aging. An SPF of 15 or higher is recommended but there's no evidence that SPFs of higher than 50 provide additional protection (4). The US FDA Sunscreen Monograph lists seventeen allowed sunscreen active ingredients. Of these actives, two are minerals while the remaining fifteen are synthetic chemicals. Each active ingredient has its own unique spectrum of protection, ranging from full UVB protection to full UVA protection and everything in between. Only one chemical ingredient, Avobenzone, and one physical active ingredient, zinc oxide, offer full UVA protection. If using only chemicals, multiple active ingredients must be used to achieve full broad spectrum sunscreen protection. Zinc oxide is the only single active ingredient allowed here in the US that offers full UVA and UVB protection (5). The decision made in 1970 by the FDA to place sunscreens products in the OTC category is actually blocking some of the new sunscreens available in Europe. It has been a long time since the FDA has approved a new sunscreen due to the lack of safety data, as well as insufficient funds. The last over-the-counter (OTC) sunscreen ingredient to be approved by FDA was in the 1990s. Since 2002, eight new sunscreen applications have been filed and are still awaiting final decisions 14 years later. New sunscreen technologies currently awaiting for approval in the U.S. have been widely available in Europe, Asia, and Central and South America, in some cases for more than 20 years. The Sunscreen Innovation Act (SIA) was enacted on November 26, 2014 to provide an alternative process for the review of safety and effectiveness of nonprescription sunscreen active ingredients.,(18) will access to the latest sunscreen ingredients and innovative sun protection (7). Sunscreens have been widely used by the general public for their photoprotective properties, including prevention of photocarcinogenesis and photoaging and management of photodermatoses. It is important to emphasize to consumers the necessity of broad-spectrum protection, with coverage of both ultraviolet A (320-400 nm) and ultraviolet B (290-320 nm) radiation. Modern sunscreen products provide broad-spectrum UV protection and may contain one or several UV filters. A modern UV filter should be heat stable and photostable, water resistant, nontoxic, and easy to formulate (13). Identification of a substance that meets these criteria is as difficult as discovering a new drug; hundreds of new molecules are synthesized and screened before a lead candidate is identified. The most important aspect in the development of a new UV filter is its safety. There are two general types of sunscreens, physical and chemical ones. Physical/Mineral sunscreens sit on top of the skin and reflect the UV rays back away from the body, while chemical/organic sunscreens actually absorb into the skin. 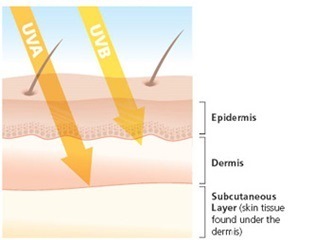 Once absorbed, when UV rays hit them the chemical sunscreens release the UV rays' energy as heat. Converting UV rays into heat is part of what causes chemical sunscreens break down after being used for a few hours while physical sunscreens tend to last longer. All sunscreen labels will say to apply 20 minutes before sun exposure but mineral sunscreens will work quicker and it is advisable to reapply every two hours no matter which type of sunscreen you use . It's also recommended to apply Chemical/Organic sunscreens around 20 minutes before heading out into the sun. Chemical/Organic sunscreens need to absorb into the skin before they become effective while mineral sunscreens tend to work immediately because they sit on top of the skin. Physical/Mineral sunscreens tend to be better tolerated by most skin types because the Chemical/Organic filters used in chemical sunscreens can be irritating for many people. However, Physical/Mineral sunscreens tend to leave a white cast or white streaks after application and don’t offer as much UVA protection compared to Chemical/Organic sunscreens. Physical/Mineral sunscreens are also a bit thicker so they may be more difficult to apply. Sunscreen active ingredients (mineral vs. chemical) are listed in the table below. Note that these are the UV filters approved for use in the US. Other countries have different and/or more ingredients approved as chemical UV filters. People seeking relief from chronic skin, respiratory and joint conditions benefit from the unique solar and mineral properties found only at the Dead Sea. The Dead Sea is the lowest point on Earth, more than 400 meters (m) below sea level. The sun’s rays must pass through not only these extra 400 m (about 1,300 feet), but also the haze. The haze helps to filter out the shorter of the sun’s ultraviolet rays, which are the most damaging to the skin. There is a relative preponderance in the atmosphere of ultraviolet A (UVA) over ultraviolet B (UVB) at the level of the Dead Sea as compared to other locations. Overall radiation intensities are lower at the Dead Sea than at other locations because of the thicker layers of air the radiation has to go through. 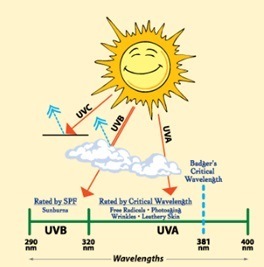 UVB is further diminished relative to UVA because of the greater diffraction of shorter wavelengths. This fact accounts for the reduced danger of sunburn and for the longer exposure times possible at the Dead Sea as compared to, for instance, the coast of the Mediterranean or up in Jerusalem . (17). (9)J Am Acad Dermatol. 2008 May;58(5 Suppl 2):S149-54. doi: 10.1016/j.jaad.2007.04.035. (12)Exp Dermatol. 2009 Sep;18(9):781-8. doi: 10.1111/j.1600-0625.2009.00865.x. Epub 2009 Mar 23. Mancuso JB1, Maruthi R2, Wang SQ3, Lim HW4,5.